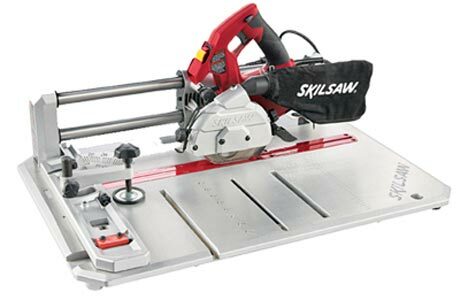 We see a lot of interesting tools throughout the year and the Skil Model 3600 Flooring Saw is certainly one of them with its unique rail design. It was made with wood and laminate flooring installers in mind and covers many of their needs with this one saw, that would normally require more. It provides 0-47 degree miter cutting to replace your miter saw, with miter detents at 22 ans 45 degrees. It also can be used as a table saw replacement and rip flooring up to 8 inches wide. This is done by locking the saw in place and pushing your material through. It uses a 7 amp motor to spin a 40 tooth 4-3/8 inch carbide blade which allows for cutting hardwoods up to 3/4 inches thick. You can almost call the saw a portable radial arm saw. It seems Skil thought of everything and made the height of the saw the same as 2x material. Using 2x as buildup should eliminate the hassle of cutting long pieces. A portable saw isn't any good if it is heavy, so Skil was able to keep the weight down to 24 lbs. by using cast aluminum. At $159, the 3600 Flooring Saw is priced just right for the DIYer, but Skil also says it is built tough enough for even the pros.